The government should be "hanging their heads in shame" over its efforts to tackle illegal Gypsy and traveller sites, MPs have warned. Ministers are being urged to change their policy and "make deliberate trespass a criminal offence". Tory MP Mark Francois said this would give police "a real deterrent power" to move travellers from land they do not own or have permission to be on. 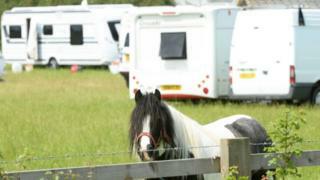 A spokesman for the Gypsy, Roma and traveller community said criminalisation was "unhelpful". "The government should focus on supporting local authorities to build more authorised sites and stopping places - and to allow Gypsies and travellers who want sites on their own land equitable access to the planning system," said Jim Davies from The Traveller Movement. Mr Davies told the BBC that recent research conducted by the charity revealed that 91% of the traveller community "experienced discrimination". He called on the government to promote equality. "Criminalising stopping is unhelpful and will only aggravate issues experienced by gypsies, Roma and Irish Travellers whilst ensuring even poorer relations with the rest of society," he said. Leading the debate on Gypsies and travellers in the Commons on Monday, former Tory minister Andrew Selous said the "time for endless, constant reviews is over". The government is currently preparing its formal response to a consultation on the law around unauthorised caravan sites and developments. But Mr Selous said people who were seeing "atrocious living conditions in their areas, which often become ungoverned space where modern slavery and other crime flourishes, want action now". My name is Debbie Saunders. I am a Romany Gypsy. I have lived in a trailer (caravan) all my life. My family and myself have travelled through England for many years, but now, sadly, it seems the people who run our government and the people I call my countrymen want this stopped. The doors of England are open to every culture, every colour and every creed - that is, unless you are a Gypsy or traveller, then you are not welcome. I'm faced with hatred and racism every day of my life - and then I get told it's not racist because Gypsies aren't a race. Should I be looked at with mistrust because of what I am? Should my children have to accept it as well? Why should I have to change my life, my culture, my heritage to conform with the ideals of the non-travellers? The Conservative MP for South West Bedfordshire said there had been 116 unauthorised traveller camps in Central Bedfordshire last year. Clear-up costs were around £350,000, he said, with 250 tonnes of litter cleared from one encampment. He said current policy was failing both traveller and settled communities. "The whole situation is a complete disgrace in the United Kingdom in 2018, and government ministers and officials responsible for this policy area should be hanging their heads in shame," Mr Selous added. The government said the majority of the traveller community were law-abiding. Mr Selous and Mr Francois were among those arguing for the government to emulate Ireland, which in 2002 made deliberate trespass a criminal offence. The knock-on effect of this change has been that more travellers have arrived in England from Ireland, as "we are regarded as something of a soft touch", Mr Francois added. A change in the law would give police greater power to move travellers on. "If they did not do so, they could be arrested, and their vehicles could be impounded - which, believe you me, would be a very powerful deterrent to the travelling community." In response, communities minister Kit Malthouse told MPs the communities secretary had recently met the Irish government to discuss their approach.